I’ve always been frugal. I’ve also never been flush with cash. Most importantly, I’ve always budgeted and made sure that my income, no matter how big or small, can work for what I need it for. Following a budget reigns in my spending and gives me peace of mind so that I feel in control of my financial destiny and know that I have money allocated to pay the bills and buy groceries as well as for fun nights out or a trip to the mall. I like budgets and spreadsheets and keeping track of my expenses. It works for me to have a detailed spreadsheet or the Easy Envelope Budget Aid (an amazing free app and website) which I can use to track every penny. But not everyone likes budgets. When my husband and I were dating he never budgeted. He paid his bills and when the money ran out it was gone, even if it was gone before the fridge got stocked. He didn’t worry about where it went to and would just look forward to the next paycheck to pay for things he needed. He lived in the now and spent in the now. One day I stopped at the ATM and he saw my account balance printed on my receipt. “But you have money! Why do you always say you can’t afford things?,” he exclaimed. I explained that I had my budget set up so that I was two paychecks ahead (my April paychecks made up my May budget) so I had a buffer in case I needed to float an expense. That gave me security because I wasn’t actually out of money in case of an emergency. He didn’t get it and thought I was just being overly cautious and a pinch penny. Three months before our wedding a few years later, he unexpectedly lost his job. We had rent to pay, groceries to buy, bills to pay and, suddenly, half the income. To the budget spreadsheet I went and I manipulated the numbers until we made it work. Granted, a lot of expenses had to be cut and we had to dramatically reduce our expenses, including food and entertainment (that’s when I learned how to coupon), but it worked. We didn’t have any money in savings but because of that two paycheck buffer, I had the cash on hand to pay our rent in full because not being homeless is a priority for us. Then we pushed ourselves back onto the month-ahead budget. All the bills got paid, we didn’t go hungry, and we had a plan for the future, all because we budgeted ahead. My husband thanked me for my plan-ahead budget and was grateful that we weathered that crisis. Now he gets why I budget so aggressively and tries to be more frugal himself. He’s not a penny-tracker and probably never will be, but he understands the importance of a well-managed budget. With the month-ahead budget, because we had the entire amount of that month’s budget up front, it allows us to pay the bills at the beginning of the month and still have money available for groceries so there’s no more worrying about whether we can eat cause we just spent our entire paycheck on rent (in the DC area that’s a frequent problem because rents are so high). So how do you get on a month-ahead budget if you’re not already? It seems impossible if you are living paycheck to paycheck but it’s not. First, make a good budget. Identify what your fixed bills are (rent/mortgage, utilities, cell phone, gym membership, debt payments) and what your floating bills are (entertainment, groceries, gas, anything that doesn’t have a fixed amount). A good way to determine how much your floating bills amount is to track your receipts for a month and use that as an estimate. You can always adjust it later. And don’t forget to include a category for savings. Having cash on hand for an emergency is priceless. Second, make sure that the budget is lower than your monthly income. If it’s not, call the cable company and drop HBO, coupon more and cut your grocery budget, cut that entertainment budget dramatically. Do whatever you have to do to make your monthly expenses fit into your monthly income. Once you get used to living inside that budget, push onto the month-ahead budget. This is easiest on those months where you get three paychecks rather than two. Leave that extra paycheck aside and allocate it for next month’s spending. See this monthly chart below? That’s how sticking to your budget can allow you to budget ahead painlessly if you get paid every two weeks. 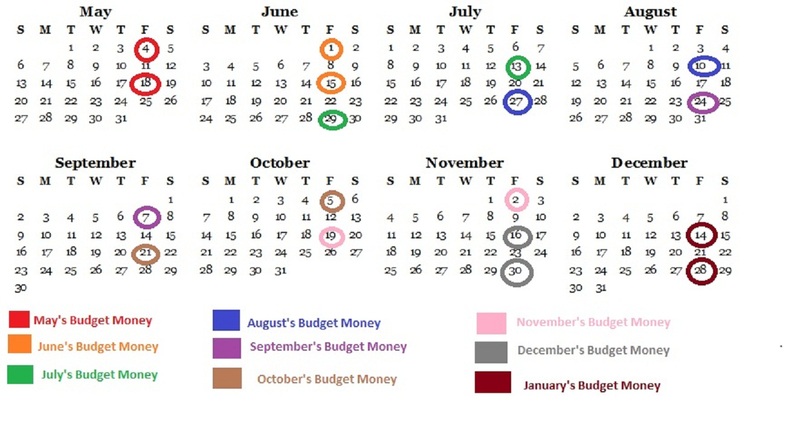 The circled dates are paycheck days and the colors correspond to the months which the paychecks will be budgeted toward. If you don’t get paid every two weeks, then save up so you have an extra paycheck amount. Save your entire entertainment budget that month if you have to. Then once you are used to being one paycheck ahead, save up for the second paycheck amount. Budgeting on the month-ahead plan is really easy. You have your current month’s income derived from the previous month’s paychecks so when you get those paychecks leave them in your account and just work off of the money in your current month’s budget. Then, when the next month rolls around, allocate those previous month’s paychecks into your budget and you will have all of your month’s budget money at once up front. This budget changes how you think about your bank account balance. Now the number you see in your balance will be your current month’s spending money plus next month’s spending money. The month-ahead budget may not work for every family but it sure has worked for ours. Having a set amount every month keeps my budget on track and any extra income (“leap” third paychecks in a month, money from mystery shopping) gets funneled into savings or debt payoff, or to cover any unexpected over budget expenses. Most importantly, I appreciate the security that not living paycheck to paycheck brings. Yes, we are still broke and are barely keeping our heads above water financially, but we are making do with what we’ve got and I don’t have to wonder whether I can buy groceries this week or if I will have to wait until my next paycheck. And that’s financial security I can budget for. Good budget strategy, Alice! It’s always best to make do what you have and keep enough for savings. But because you have savings doesn’t mean you can spend unconsciously. Savings are meant to be kept for future use. I keep mine for a particular investment. Sometimes, when I am really left short in cash, I apply for a payday loan as long as I have enough left till next payday.